HRITHIK ROSHAN has become Bollywoods hunky heartthrob now, with girls literally swooning over him. Its an authentic trade fact that the "repeat viewing value" of Kaho Na Pyar Hai has surpassed that of many earlier Hindi hits. And how! A group of smitten girls from Mumbais famed Petit Girls High School claim to have seen the movie over 85 times already... and are determined to hit a century. Hot stuff, right? At the same time, Roshan Jr has sent chills down the spines of the other heroes. Shah Rukh Khan, frinstance. Badly bugged by being constantly shown the thumbs down sign in the print and electronic (TV) media during live chats with cinegoers, he lost his shirt the other day and (almost) yelled into a cable TV interviewers mike: "Hrithik, Hrithik, Hrithik! Dont you have anything else to talk about? This kiddo comes along and is immediately made out to be a one-newcomer film industry. Its sickening! Ive spent decades here to reach where I am, see? 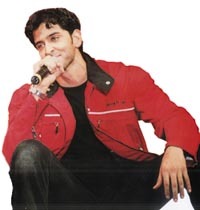 Lets see if anyone even remembers the name of Hrithik Roshan in 2005........"
Take a deep breath and cool it, Mr Khan. After all, everybody IS talkin about Hrithik Roshan  and nothing you may say is gonna change that! Incidentally, while on the 26-year-young phenomenon, I find it rather interesting (and amusing) that hes caught up in so many new assignments, that he doesnt have the time to give shoot dates to his own father! You know, filmmaker Rakesh Roshan is apparently (and understandably) keen to start his next film with Hrithik... but sonny can only mutter "Sorry, Dad" since he is totally booked for the next five years! As a matter of fact, Rakesh, Im told, is ready with his new script for a film (tentatively) titled Kah Do Na in which he has paired Hrithik with Kareena Kapoor... but how on earth can he start set shooting until he has the leading mans dates, huh? Ironic and inane. For quite a long while now, Nana Patekar was being elusive and hard to meet  because he wasnt in Mumbai at all! Well, the secret is out: He has found a sanctuary in solitude where he loves to write poems! Much as I tried, I couldnt get him to share them with me. However, it appears his writings are basically about (in-depth) introspection. Rather personal. Nana loves to roam around the interiors and the jungles of Maharashtra. This, he feels, brings him very close to nature... "And Im a very natural human being. When I am alone, solitude is my best friend and confidante. Its so blissful and full of utter solace and peace," says Nana. No wonder, one of his fave haunts for such jaunts is a small, sleepy village called Brasgaon  no phones, no television  not even newspapers!